YELLOW SPRINGS — A historic exhibition of iconic documentary photography will be coming to Antioch College. 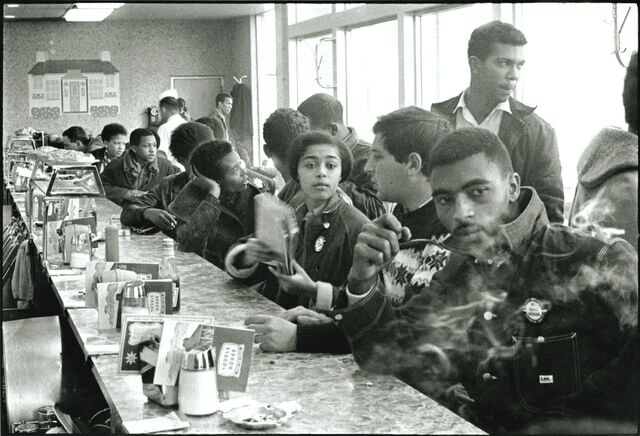 “Danny Lyon: Memories of the Southern Civil Rights Movement” will be on display in the Herndon Gallery from now to Aug. 7. The reception, open to the public, will include live performances by local artists and activists involved in the #BlackLivesMatter and Justice for John Crawford movements. Featured are slam and performance poets John Booth, Furaha Henry-Jones and G. Scott Jones performing spoken word pieces, while visual artist and citizen activist Migiwa Orima makes screen prints in the gallery. Migiwa’s protest banners visually connect the local protest movements to the national movement. Between marches, these banners will reside in the Herndon Gallery. The exhibition will also feature the archival slide montage known as The Gegner Incident, created by Brian Springer. It includes archival newspaper clippings and photographs of a local civil rights citizen protest around racism in a local barbershop in Yellow Springs in the 1950s. Antioch College and the Herndon Gallery will also host a special reception and conversation from 1 p.m. to 3 p.m. on Friday, June 19, with David Goodman ‘69 and Steve Schwerner ’60 (Brothers of Andrew Goodman and Michael “Mickey” Schwerner, who along with James Earl Chaney were murdered by the Ku Klux Klan in Neshoba County, Mississippi during the Freedom Summer campaign in 1964). Artist Danny Lyon will also be present for a book signing in the Gallery following Goodman and Schwerner’s reflections. The second publishing of Lyon’s out-of-print memoir was made possible through the generosity of Antioch College trustee David Goodman and The Andrew Goodman Foundation. As part of Antioch’s Reunion 2015 events, David Goodman and Steve Schwerner will also tell “The Chaney, Goodman & Schwerner Story” at 4 p.m. on Saturday, June 20 in the college’s Foundry Theater. The event will be moderated by Mila Cooper, Director of the Coretta Scott King Center. All events are free and open to the public. The Gallery will also present an artist talk with Danny Lyon via Skype from 7-8 p.m. Thursday, July 16. Story courtesy of Antioch College.